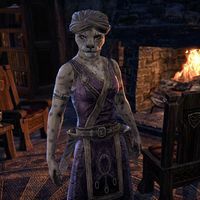 Anisha is a Khajiit member of the Dragonstar Caravan Company found in their local headquarters located in the city of Evermore. She walks between the first and second floors. She tells you, "These foolish, dungy Bretons starve while a banquet flies overhead! Famine? Ha! Anisha eats like a queen! Crow is bony, yes, but tasty!" This page was last modified on 15 September 2018, at 16:36.